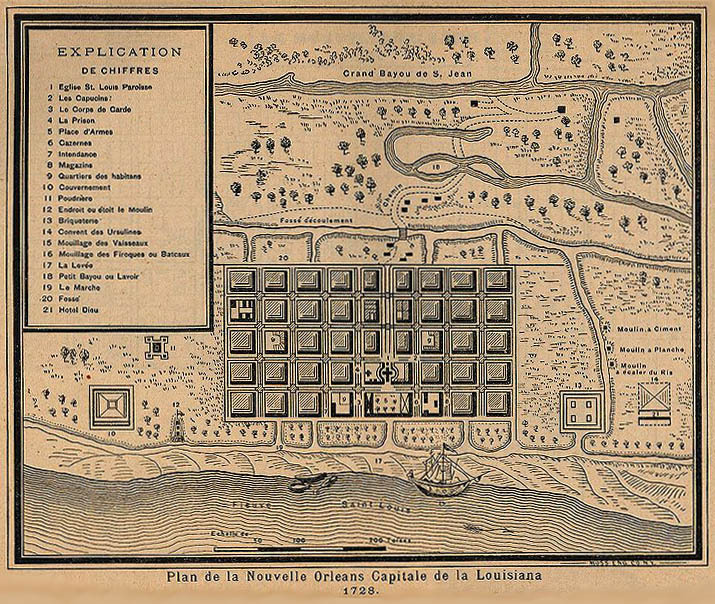 Map of New Orleans, 1728: "Plan de la Nouvelle Orleans Capitale de la Louisiana 1728." The map shows the city of New Orleans at the time that Alain Jardelat and family were living there on Rue St. Anne, a street that runs vertically just to the right of the church, shown on the map by a cross in the center of the old French Quarter. Pierre Jardelat was born here about 1733. Pierre Jardelat was born about 1733 in New Orleans to Alain and Marie Jardelat.1 At least two of his older siblings had already died by the time he was born. Pierre married Marie Songy in New Orleans on 19 May 1761.2 In a list of French military troops in the Mississippi Valley and Gulf Coast in 1745, "Alain Jardelas called Tempete" and "Pierre Saunier called Languedoc" are both fusiliers - soldiers who carried muskets.3 Because Marie often used the name Languedoc instead of Songy, this Pierre could possibly have been her father. In 1686 the Arkansas Post became the first permanent European settlement in the lower Mississippi River Valley. In 1763 the Spanish took possession of all French territory west of the Mississippi River. Three years later, on 5 March 1766, Antonio de Ulloa arrived in Louisiana to take over as the first Spanish governor. Two months later he ordered a census taken of the new colony. By 5 January 1770 the family had grown: Pedro Jardelat, Maria, his wife, three boys (Pedro and two unnamed), one girl named Carla and one girl unbaptized. At that time, the total population was 79, more than half the population being children. In 1780 Pierre is listed as Corporal 2d Class Pedro Jardelat. His son Pedro, about sixteen, was also a member of the militia. Pedro, the father, would have been about forty-seven. In 1791 the census lists Pierre Jardela, white male, age category 3, farmer, and three slaves.7 Being in category 3 - 49 and older - probably meant that Pierre was no longer in the militia because of age and was now a farmer. His crops in the next few censuses consisted of maize, wheat and tobacco. Also listed in 1791 are Marie, his wife, age category 2; five sons, two under thirteen and two of military age; three daughters, two under thirteen and one over thirteen; and three black slaves. In 1793, Pierre and Marie had nine children living at home. Their oldest daughter, Charlotte (Carlota), had married Josef Reynes in 1786 and was living in New Orleans. There were forty households at that time living at the Post with a total of 220 people. A year later, in 1794, the population had grown to 336 and all of the children are named in the census: besides Pedro (Pierre) and Maria (Marie), there are three sons of military age: Pedro, Luis and Alexo, and two younger sons, Juan and Jose; three daughters over thirteen: Louison [Louisa], Maria Louisa and Margarita, and one under thirteen: Judit. A daughter, Adelaide, was born 15 March 1779 and baptized on 9 July 1786 at the same time as her brother Alexis, but she does not show up in the list of names in any of the censuses or other documents.9 It is possible that she died, but no record has been found for her except her baptism. On 28 April 1798 Pierre Jardelat was buried at the Arkansas Post. Present for the burial were his children Pierre, Louis and Marie Louise.11 Several months later, on 2 December 1798, a final census was taken. The "Widow Jardelat" was listed as raising wheat and maize, but not tobacco. Seven children were still living with her, two of whom, Jose and Judit, were still thirteen or younger. In 1803, with the Louisiana Purchase ceding the area to the United States, more American settlers began moving in. Charlotte, Marguerite, Louise and Luis had married, Charlotte in 1786, Louise in 1798, Marguerite in 1799, and Luis in 1802. Marie was still living at the Arkansas Post on 30 July 1806 when she sold a slave, Marie Jeanne, to Mr. Jean Larquier. Marie signed with her mark.12 Jean Larquier was the husband of Marie's daughter, Marie Louise. The 1728 map of New Orleans was taken from from "Report on the Social Statistics of Cities," Compiled by George E. Waring, Jr., United States; Census Office, Part II, 1886. Available from the website Wikimedia Commons, and is in the public domain. Abstract of Catholic Register of Arkansas (1764-1858), Dorothy Jones Core, compiler and editor. DeWitt, Arkansas, Grand Prairie Historical Society, 1976, p. 83. Pierre's parents are given in the burial record as Pierre Jardelat and Marie Guerique. In his marriage record to "Marie Sogny" his parents names are given as Alen Gerdela and Marie Kierite. The transcription of the marriage record gives her name as Sogny, but most other records of this name are spelled Songy, sometimes spelled Saunier, Sonnier or Songe. In Pierre and Marie's marriage record, Marie's parents are Pierre Songy/Sogny and Jeanne Genton. At the baptism of Pierre and Marie Jardelat's daughter Charlotte, the godparents, or sponsors, are ____Songy and Charlotte Rillieux, who signs as Charlotte Songy. Sacramental Records of the Roman Catholic Church of the Archdiocese of New Orleans, vol. 2, 1751-1771, edited by Rev. Msgr. Earl C. Woods and Dr. Charles E. Nolan. New Orleans, Archdiocese of New Orleans, 1988, p.155 (SLC, B5, 138). Baptism was 20 July 1766. In another child's record of baptism, Charlotte Rillieux is also the sponsor, along with a Pierre Songy who is in the militia. Charlotte is listed as the wife of Joseph Songy, scrivener for the navy. Sacramental Records, vol. 2, p.213. The sponsors at a baptism for Anne Charlotte Mouton are Pierre Songy, militia officer, and Charlote Rilieux, spouse of Joseph Songy, scrivener (SLC, B5, 109). Joseph Songy, married to Charlotte Rillieux, is the son of Francois Songy; he has a brother, Francois, and a brother Pierre, a goldsmith. These Songys are most likely related to Marie Songy but it is not known yet what the relationship was. Sacramental Records of the Roman Catholic Church of the Archdiocese of New Orleans, vol. 2, 1751-1771, edited by Rev. Msgr. Earl C. Woods and Dr. Charles E. Nolan. New Orleans, Archdiocese of New Orleans, 1988, p.136. Jardelat is spelled Gerdela. Marie's surname is Sogny or Songy in the marriage record but later she goes by Languedoc. De Ville, Winston, French Troops in the Mississippi Valley and on the Gulf Coast: 1745. Ville Platte, Louisiana, 1986. Arkansas Colonials: a Collection of French and Spanish Records Listing Early Europeans in the Arkansas, 1686-1804. Comp. and ed. by Morris S. Arnold and Dorothy Jones Core, Commemorating the 300th Anniversary of Arkansas Post. A Sequicentennial Project of the Grand Prairie Historical Society. DeWitt, Arkansas: DeWitt Publishing Co., . All census information in the following paragraphs comes from this source. "The Arkansas River and the Development of Arkansas Post," by Roger E. Coleman, Arkansas Historic Preservation Program. Originally presented as a paper at Arkansas Post National Memorial on May 18, 1991 for the tenth annual Arkansas Heritage Week. Published to the web by the National Park Service Archives at http://www.nps.gov/archive/arpo/history/coleman.htm. Accessed 22 April 2009. Rather than stating ages of people in the census, it was done by age categories. Age category 1 was thirteen and under; age category 2 (military age) was over thirteen and under fifty; age category 3 was over forty-nine. At one point in the census, categories one and three were switched. Languedoc can be a "dit" name for Saunier or Songy, meaning that the person sometimes went by another surname. Languedoc was also sometimes transcribed as Langdoc. If the handwriting was hard to decipher in the original records, as it often was, Langdoc could look like Lanode, which is how it was transcribed in one record. In the marriage record for Pierre ("Pierre Gerdela, son of Alen [Gerdela] and Marie Kierite") he married Marie Songy on 19 May 1761. Marie Songy and Marie Languedoc are the same person. Abstract of Catholic Register of Arkansas, 1764-1858. Adelaide's birth date is given in the record of baptism. More research needs to be done on this topic. Where would these young ladies have learned to write? Where might they have gone to school? The Ursuline Convent did educate young ladies at the time and they may have gone there. Abstract of Catholic Register of Arkansas, 1764-1858. The names listed as present at the burial may have been just the names taken as witnesses. There may have been others at the burial. "People of the Post: Mary John, Slave, Cook and Tavern-Keeper." The Arkansas Post Gazette, Vol. 3, Issue 2, Winter 2002-2003, p.6. Marie Languedoc, the Widow Jardelas, appeared in court to sell her slave, Marie Jeanne, a creole negress. She would have died some time after this. “Montgomery’s Tavern and Johnston and Armstrong’s Store.” Historic Structure Report, Historical Data, by Edwin C. Bearss. Washington, D.C., Office of History and Historic Architecture, Eastern Service Center, May 31, 1971. Published to the web at http://www.nps.gov/archive/arpo/monttav/index.htm. Accessed 22 April 2009. Sacramental Records of the Roman Catholic Church of the Archdiocese of New Orleans, Vol. 6, 1796-1799. Ed. by Earl C. Woods and Charles E. Nolan. New Orleans, Archdiocese of New Orleans, p.53, 140, Marriage of Margarita Jardelat and Pablo Graupera, April 2, 1799. Margarita is from Las Arcas (Arkansas). He is from Calella, Catalonia [Spain]. They were married in the St. Louis Cathedral but not the one presently standing which was rebuilt in 1849-50 after being destroyed by fire. Marriage Certificate for Celestino Gonzalez and Pauline Graupera. Escambia Co., Florida, Marriage Records. Book A, p.18. FHL Microfilm 941001. Will of Marie Languedoc. Copy of original handwritten will with English translation from French accessed at the University of Arkansas, University Libraries, Digital Collections website: http://digitalcollections.uark.edu/cdm/compoundobject/collection/CAPA/id/325/rec/1. The will is from the series: The Colonial Arkansas Post Ancestry Digitized Collection.